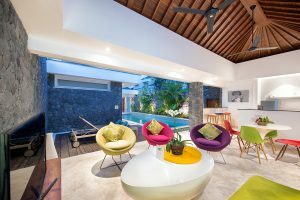 Villa Yasmee is a chic little Seminyak hideaway that’s been beautifully designed to welcome in the natural light. 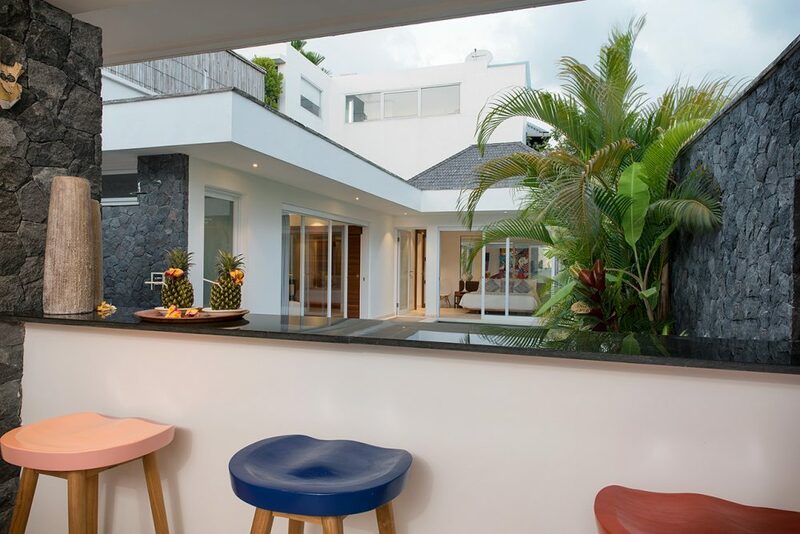 The space is minimalist, dotted with pops of colour and furnished with a mix of modern as contemporary homeware for both comfort and style. 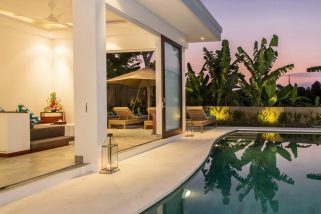 The pool stretches the length of the villa, reflecting the light and offering a cool escape on those hot sunny Bali days. 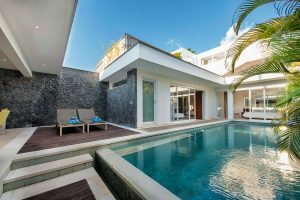 The location in central Seminyak makes it ideal for those wanting to lush out in the cafes and bars or shop with abandon in the best boutiques Bali has to offer. 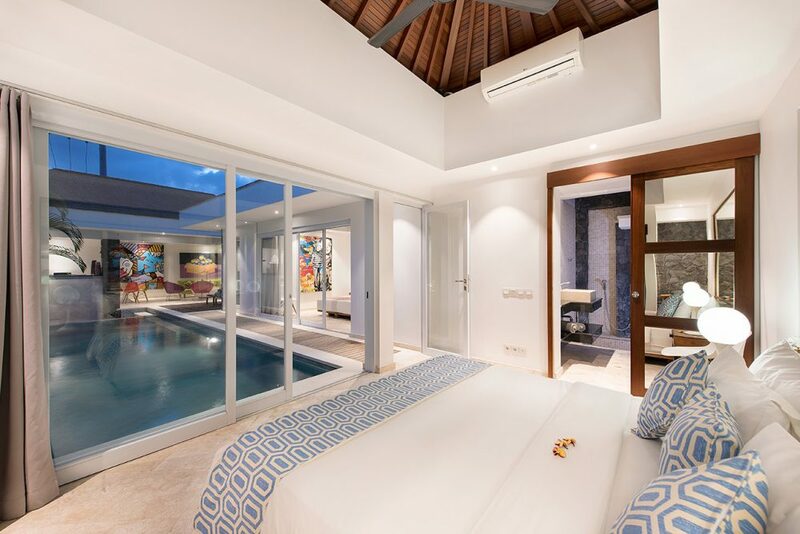 Sliding glass doors reveal bedroom spaces just beckoning you to escape into their cool, air-conditioned interior design. 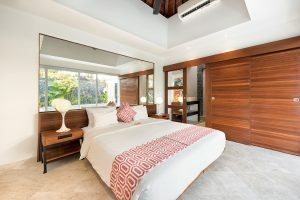 High-quality linens dress both beds with accents and accessories in different colours. Fushia and subtle cream make the first double room a perfect hideaway for the grown-ups and there are twin beds in the other room which is dressed in bright primary colours for the kids. 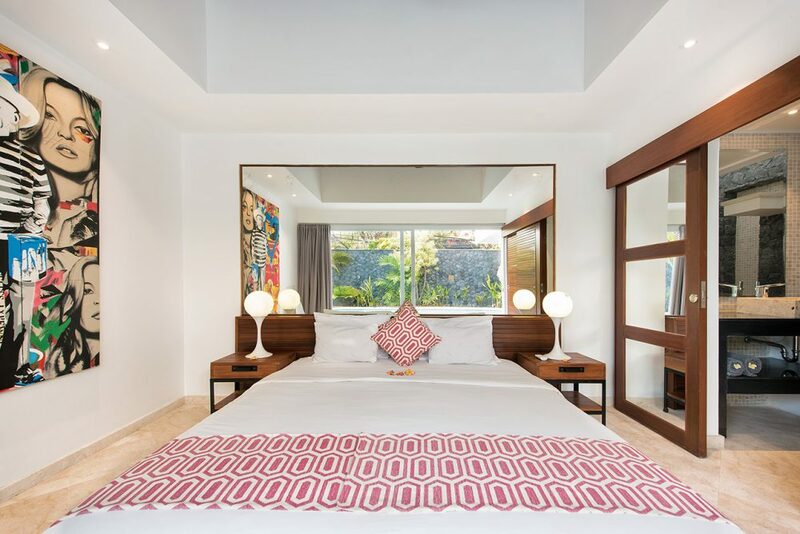 It’s good to remember that the twin room can be converted to another double kingsized bed to accommodate a total of four adults looking for an exclusive Seminyak getaway. Each bedroom features large wall mounted mirrors above the bedhead to both maximise space and reflect back the tropical colours from outside. 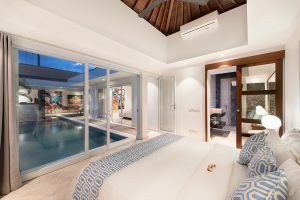 The rooms also have plenty of storage space, a safe and bedside tables with softly glowing lamps to set the mood. 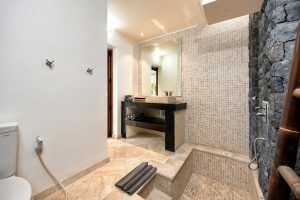 You’ll find the ensuites are generously appointed with rainfall showers and smooth rock walls that bring the Bali tropical vibe right into your room. The villa is compact but laid out in such a way as to maximize the space. The soaring, whitewashed walls of the living area are accented by touches of ultra-modern furniture and colourful art. 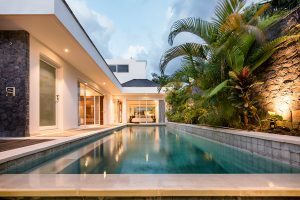 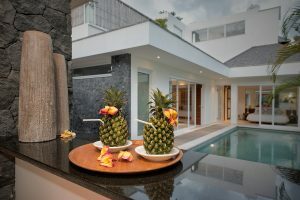 It’s a prime spot for relaxing as you gaze out over the pool, watch a movie or just groove to music while you shake up a cocktail in the adjoining kitchen. The light floods this space and fans cool the dining area from above. 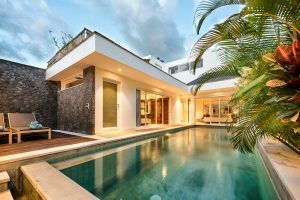 Kick back on the wooden deck and find yourself surrounded by charming pot plants and a stone wall that rises high enough to protect your privacy, allowing even the skimpiest bikinis. 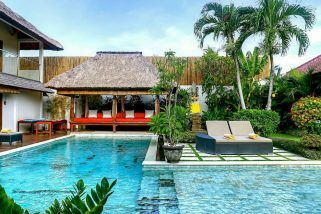 The pool is completely azure and ready to host a morning dip, a midnight swim or just a lazy afternoon float to cool you down. 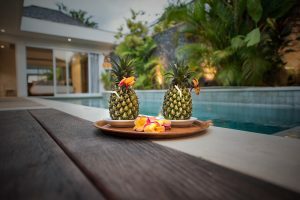 If you don’t like to get wet, you can make yourself comfortable on the loungers and soak up the sun with a book in hand and a cheeky glass of wine. Villa Yasmee is literally in the centre of Seminyak. 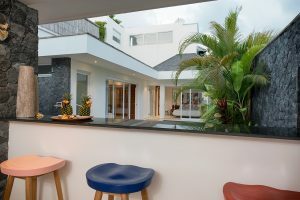 It’s nestled right at the end of Gang Werkedura making it a quiet hideaway which is less than five minutes walk to excellent coffee at Grocer and Grind, Sisterfields or Bossman. 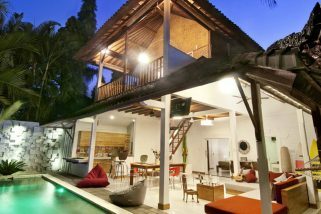 Seminyak Square Shopping Mall and Seminyak Village are also very close and offer international brands for your perusal. 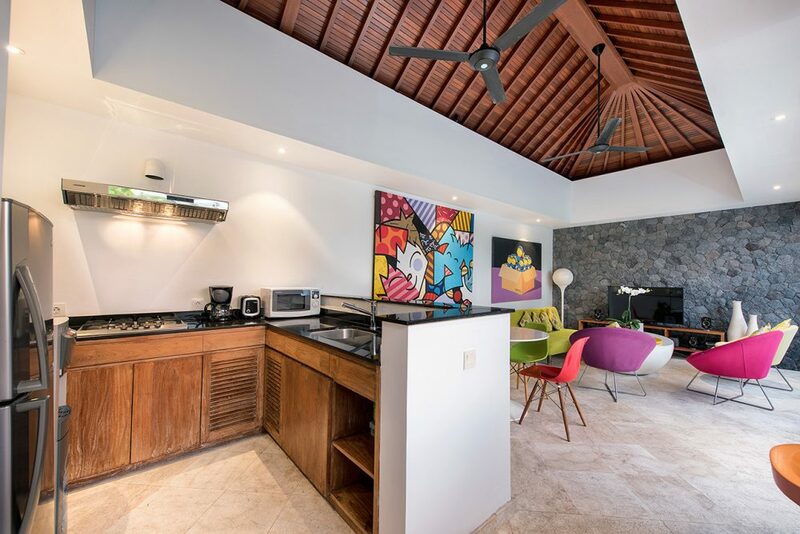 We can recommend Mexicola, a lively restaurant close by and if you can manage a fifteen-minute walk then you’ll find yourself at Bali’s famous Kudeta restaurant or even taking in the sunset with a well-deserved beer at Potato Head. 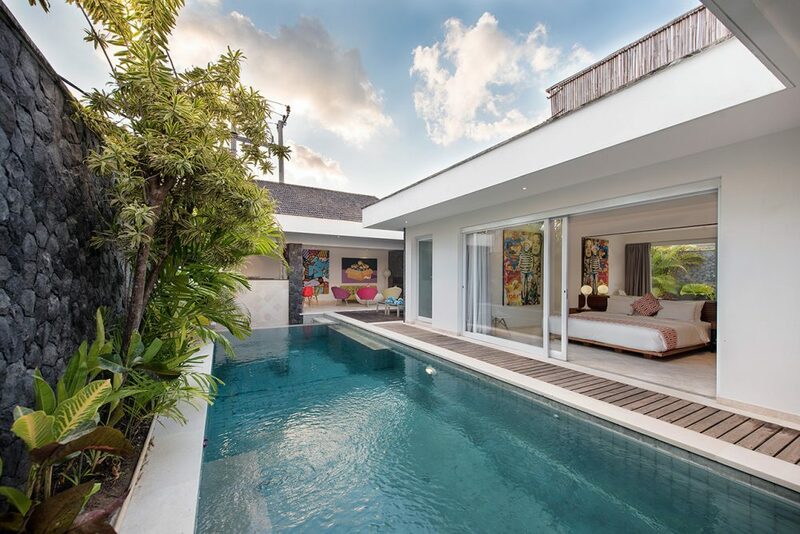 Villa Gajah is part of a twin villa complex, each villa comprising 2 bedrooms and private swimming pool.